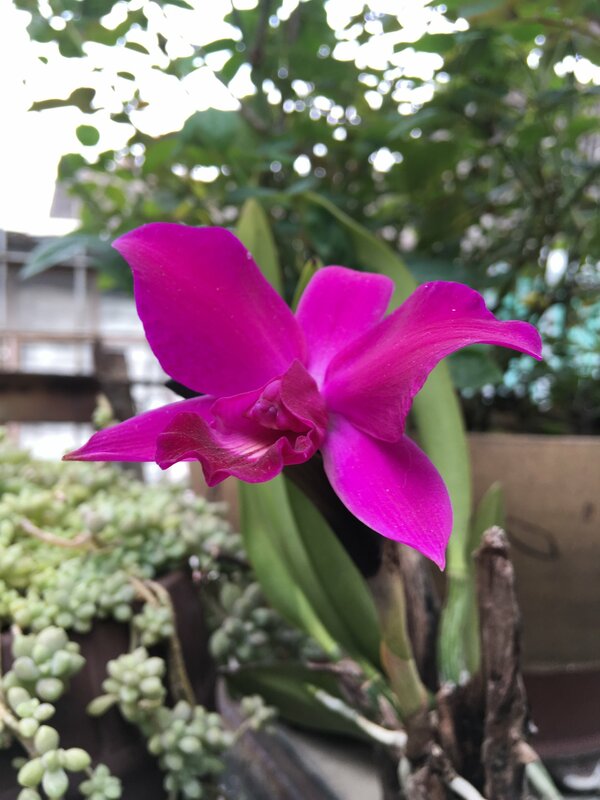 Discussion in 'Orchid Identification Section' started by yuhin, Jun 17, 2018. I obtained this Cattleya as a gift. And I kept them for years and made almost ten divisions....Though my guess is a common commercial hybrid, I am hoping to get its identification. Thank you. John Klinger and Kipper like this. Check out pictures of L. (C.) sincorana. Verrrrry similar. The plant is not like sincorana, so most likely a hybrid. My guessing is some walkeriana....I know it is a long shot, just posted it for some luck. I also agree with Marni that this is a hybrid. 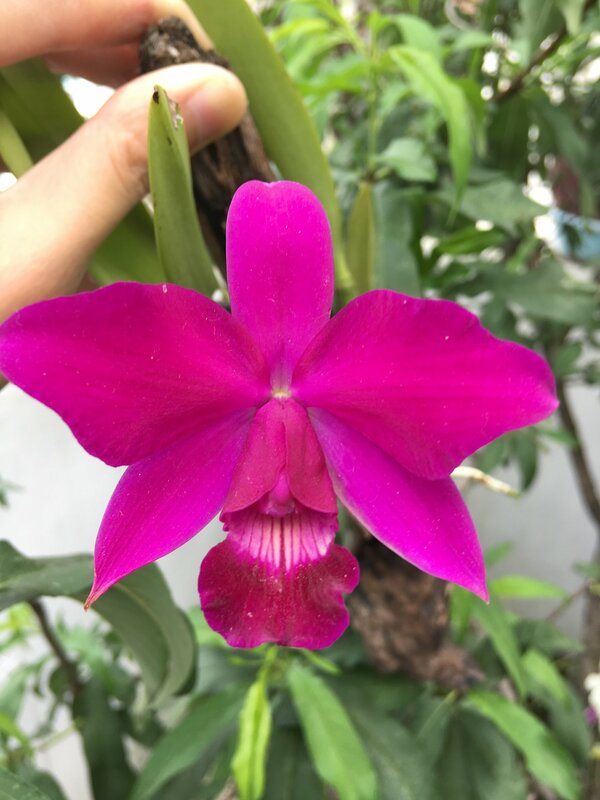 If it is a primary hybrid, could it be something like Cattleya Trudy Marsh [C. sincorana x C. violacea] or Cattleya Wavrinii [C. violacea x C. pumila]? The colour pattern with veining on the disc of the lip plus the lip shape reminds me of C. violacea. However from what I can make out in the photos, all the pseudobulbs so far seem to be unifoliate. Did any of the dried old pseudobulbs have two leaves? The pseudobulbs of the hybrid seem more cylindrical, rather than ovoid, plus the leaves are long and narrow. This makes me lean more to C. Wavrinii as the most likely candidate. I do not see any influence of C. walkeriana. Of course, if it is not a primary hybrid, then it is just a commercial hybrid. I am not a good photographer. Actually, all pseudobulbs have two leaves. But true, they all cylindrical and elongated leaves, not very walkeriana. C. Sincorana fits the pental shapes but I found the “nose-like” structure like walkeriana, not sure at all . The disc of lip probably not. Like I said, I got this as a gift. I know it is a long shot. Thanks! The "nose-like" structure you mention is the apex of the column, peering out from underneath the enfolding lip side-lobes. Cattleya violacea is the only bifoliate species. All the other likely candidates that we have discussed above: C. walkeriana, C. sincorana, C. pumila are unifoliate plants [pseudobulb only bears a single leaf at the apex]. You've confirmed that all the pseudobulbs have two leaves, so my suggestion is C. Wavrinii [assuming that this is a primary hybrid]. Both species parents produce thin cylindrical pencil-like pseudobulbs. If your plant has C. walkeriana or C. sincorana parentage, I would expect the pseudobulbs to be much more ovoid or shorter and plump. Thank you, Gary. During this Chinese New Year, I found out that this is a very common commercial hybrid with very complicated heritage, but I cannot find its registered name.